The Jets beat the London Blitz 41-15 on Saturday at Warwick Uni. In England season has just started. 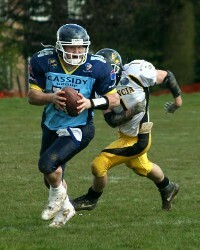 In weekend 2 Vice-Champion Coventry Cassidy Jets had to play at home against the defending British Champion London Blitz. Revanche for lost championshipgame was successful. Dominic Olney was named MVP as he led the Jets defense with 7 tackles, 4 passes defended, 1 interception & 1 fumble recovery for a touchdown, setting a new British League Record on the way (his 95 yard score eclipsed the previous mark of 80). In a re-match of 2007’s National Championship game the Cassidy Jets came away with a resounding 41-15 victory over the London Blitz. Cornerback Dominic Olney led the way for the Jets, as well as leading the team in tackles with 6 he also broke up 4 passes and intercepted another whilst his 95 yard fumble recovery marked his second touchdown in as many games. Mark Cohen and Kofi Campbell both chipped in with 2 touchdowns apiece for the second straight game but it was Steve Coles who got the ball rolling. Matt Williams returned to kicking duties for the Cassidy Jets and his short opening kick-off was recovered downfield by Joe Black. The fluke onside kick put the ball in the hands of Coles whose first carry went for 20 yards and had the Jets knocking on the door. On the following play however quarterback Dax Michelena lost his grip on the ball and the Blitz recovered the first of 3 Jets fumbles. Unable to take advantage of their host’s generosity London quickly punted the ball back. A time consuming 11 play drive ensued for the Jets culminating in Coles’ 11 yard touchdown run on fourth down. Williams added the extra point for a 7-0 lead and out the defending champions on the back foot. The Jets next possession also lasted 11 plays, this time Cohen put the finishing touch on the drive with a 15 yard reception from Michelena, who completed 11 of 16 for 131 yards. The extra point attempt failed as the American QB missed Joe Black in the endzone. With London’s offence being consistently foiled the Jets would twice add to their lead before half time. Campbell carried 5 times for 43 yards on a 7 play drive which saw him break the planes from 6 yards out. Michelena this time picked out David Sonne in the endzone to stretch the lead to 21-0. Cohen added his second when he snared a 20 yard pass to make Coventry’s advantage 27-0 and Olney ensured that the Blitz didn’t break their duck when he picked off Stuart Franklin’s pass at his own 9 yard line to end the half. Turning the tables on the Jets and needing a fast start to the second period, London opted for the onside kick, recovering at their own 47. It proved fruitless 3 straight incompletions left Coventry with the ball at their own 34. A botched snap followed by a run for minus 4 yards and an incomplete pass left the Jets facing 4th and 23. Coles went on to kick the ball away but watched helplessly as the snap sailed over his head and through the endzone. The result was a 2pt safety putting London on the scoreboard and shattering any hopes of a shutout. Desperate for a quick score the Blitz decided to get a little pass happy, Franklin completed 4 of 7 hitting Tom Shannon from 24 yards out to ignite hopes of a comeback. Nathan Holt nailed the extra point as London pulled to within 3 scores. The Cassidy Jets offence had sputtered out of the blocks in the second half, a three and out and a botched handoff resulting in a fumble appeared to have handed momentum to a Blitz squad that was lacking 2 of it’s impact players. With wide receiver Rod Bradley injured and linebacker Jason Brisbane not making the trip, London were without two of their leaders and the men that seem to set the tempo for their Championship run last season. Veteran Cassidy Jets linebacker Will White provided the lift that his team needed his interception midway through the third quarter swung proceedings back in Coventry’s favour and gives the Jets 11 picks through 5 games this year. Campbell made the Blitz pay for the turnover with carries of 30 and 19 yards, the later of which saw him run over would be tacklers en route to the endzone. Campbell, who finished with 123 yards on 13 carries, then added an exclamation by converting his own score to make it 35-9. William’s kick off was returned 72 yards where Adewale Oyemade chased down Stephen Hutchinson to make a touchdown saving tackle at the Jets 2 yards line. Middle linebacker Craig Pennington snuffed out a run in the backfield for a loss of one and on the next play White delivered the knockout blow. His tackle at the line of scrimmage jarred the ball loose after Dave Cowen had held up the runner. Olney, who was seemingly everywhere, picked up the football and outran everyone on his way to a British League record 95 yard fumble recovery for the Jets final score of the day. A handling error led to running back Coles’ unsuccessful pass attempt on the extra point conversion leaving the score at 41-9. In a deep hole the Blitz all but abandoned their running game save for John Chiltern’s 1 yard consolation touchdown. London again recovered their own kick off but it came to nothing as the contest petered out to leave the Cassidy Jets 41-15 victors. Head Coach Gerry McManus lauded a “fantastic performance that epitomised a team effort” but was quick to point out that “it’s a long season and we can’t look to far ahead. We’ve carried over our good form from our European campaign and set down a marker for the season”. Next up for the Jets is a trip to Hamilton where they’ll meet the East Kilbride Pirates for their first road game. The Pirates got their season underway this weekend with a 35-8 victory over the Gateshead Senators and will be eager to defeat the Jets for the first time after 3 straight losses.